Karlsruhe, Germany – 14. 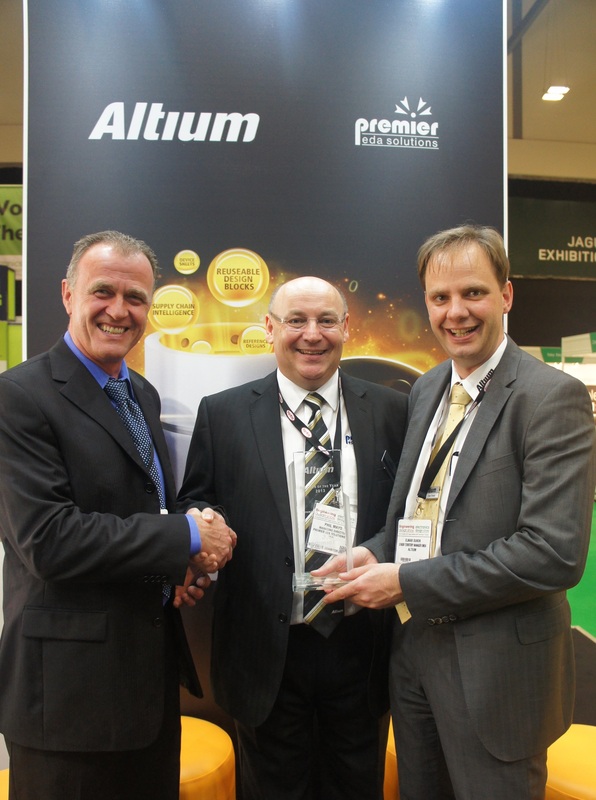 November 2013 – Altium’s UK and Ireland channel partner Premier EDA Solutions has scooped the Altium EMEA reseller of the year award. Recognising Premier’s exceptional commitment to the Altium user community in the UK and the significant growth achieved in the region, Altium presented the award to Managing Director Phil Mayo at the recent Electronics Design Show. "Phil and his team at Premier set exceptionally high standards. Their commitment to customer success, extensive market knowledge and expert technical support for users of Altium's unified electronics design solutions makes for a powerful partnership," said Elmar Dukek, Senior Territory Manager, Altium. During the company’s 20 year history, Premier has won a plethora of awards from Altium and the wider electronics industry at large. This award in particular underlines the fact that Premier has broken sales targets and customer service expectations consistently for over a decade. It also pays tribute to Phil Mayo’s extraordinary passion and engagement in supporting the UK electronics industry. Over the last few years Premier has invested in various sponsorship and free training programmes with a commercial value approaching £5M. These activities support schools, universities and other educational initiatives such as WorldSkills in a concerted effort to bring young people into the industry and ensure a bright future for UK electronics. Alan Graham, Director of the UK based design services provider, Blackstick welcomed the news and commented: “As I've gotten to know Phil, I've seen how he has such a passion for the UK electronics industry. He makes us feel very proud for being part of the same industry and the Altium award is well-deserved." Some exciting British design innovations developed with the aid of Premier and Altium Designer were showcased at the Electronics Design Show in Coventry last month. These included the solar-powered racing car Endeavour from Cambridge University Eco Racing and Angelic Bulldog, the streamliner aiming to break the world motorcycle land speed record of 400mph. About Premier EDA Solutions Premier EDA Solutions is one of Altium's leading resellers of its electronics design software, serving customers in the UK and Ireland. In addition to the Altium unified solutions portfolio, Premier EDA operates an extensive training operation, providing essential training skills for the UK electronics industry. They are also passionate about youth development and work with a number of schools, colleges and universities with programmes designed to bring new talent into the UK electronics industry. For more information, visit http://www.eda.co.uk/. You can also follow and engage with Premier via LinkedIn and Twitter.